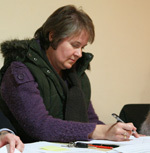 The Parish Clerk is Christine Coles. The Parish Council meets at 7.30 pm in the Church Hall during the second week of each month, except in August. and here for the Roles and Responsibilities of Parish Councillors. Notes on the most recent Parish Council meeting can be found each month in the Village Newsletter. Our family are in the process of moving to Sulgrave Village and I was wondering if there is a Brownie pack in the village for her to join or register her for? Lucy loves the Brownie’s in our village and we would like her to continue with this? Would you also have information on local registered childminders in the area? Dear Joanne, My friend in Culworth has a daughter who attends the Rainbows Brownie Pack in Helmdon (very close to Sulgrave). The contact there is Eleanor Shepherd. 01295768727 or 07960389894. Hope this helps. Bet wishes with your move. Why do we need a new bus shelter as there are few bus services? There are not crowds of people using it. Perhaps, employ a local carpenter to renovate it. Any thoughts?